« Are Impact Factors Losing Ground? Of all the terrifying things that have ever lived in the ocean, mosasaurs hold a special place in my heart. Admittedly, the similarity between the name of the biggest mosasaur species – Tylosaurus – and my own may play a small role. But mostly it’s because they are the original sea monsters. Although more closely related to snakes and iguanas than dinosaurs, these giant aquatic lizards had huge heads full of terrifying teeth that would put Tyrannosaurus rex to shame. (Literally: when it comes to skull size, mosasaurs easily outrank any land-based carnivore you care to name.) And if ruling the oceans weren’t enough, this week scientists revealed that at least one species of mosasaur had adapted itself for inland river systems as well. This particular beast comes from Hungary, a country that doesn’t usually jump to mind when thinking of fossilized beasts from the late Cretaceous. That’s because 85 million years ago, much of what is now southern Europe was underneath something called the Tethys Sea, a much bigger forerunner of today’s Mediterranean. However, within this watery channel were various Cuba-sized islands that supported tropical river ecosystems every bit as productive as today’s Amazon. So what would happen if an oceanic mosasaur decided to swim up the river? “I always get a kick out of these little thought experiments,” says Michael Caldwell, Chair of the Department of Biology at the University of Alberta and one of the world’s leading experts on mosasaurs. Just as sharks and other oceanic predators do today, mosasaurs made speculative journeys into rivers from time to time; at least one mosasaur fossil from Alberta has been found in estuarian rocks, though it was clearly a marine species. Still, given that mosasaurs existed for 35 million years, the chances of at least one species trying its hand at full-time river life seemed pretty good, although nothing was certain. Nothing, that is, until about twelve years ago, when László Makádi, Attila Ősi and some other enthusiastic paleontology students from Hungary decided to check out an abandoned bauxite mine in a place called Iharkút. In order to get at the aluminum-rich bauxite, miners had had to cut through some Cretaceous rocks, and in the slag heaps they found piles of old bones. Besides a wide variety of shellfish, amphibians, turtles and pterosaurs, the group found ancient crocodiles and plenty of mosasaurs. That’s when they called in Caldwell. 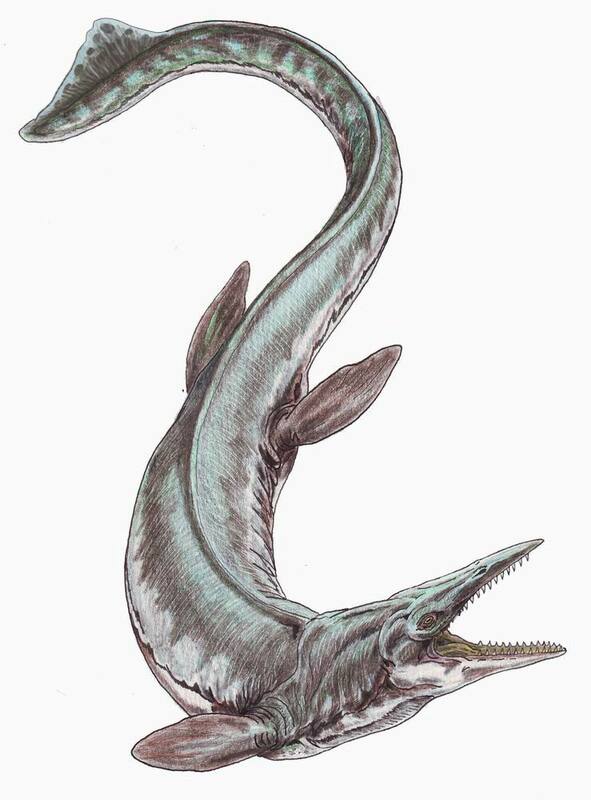 “We weren’t expecting to find a freshwater mosasaur, ever,” says Caldwell. Those feelings are captured in the species name: Pannoniasaurus inexpectatus, which loosely translates as “unexpected lizard from Pannonia.” (Pannonia is the ancient Roman name for Hungary). Unlike the earlier example from Alberta, this species has adaptations designed to help it thrive in the river. For one thing, it’s smaller than usual: judging from its vertebrae, P. inexpectatus likely reached lengths of about 6 metres. That may sound quite bit compared to modern predators like crocodiles, but it’s nothing compared to the 18-metre behemoth that was Tylosaurus. The most important adaptation was found in its skull. Like their modern-day lizard relatives, most mosasaurs had head that were relatively deep from top to bottom. In contrast, crocodiles have flattened skulls with eyes and nostrils perched on top, perfect for lurking in the shallows and ambushing prey. “This particular mosasaur has the same kind of flattened head,” says Caldwell. “It still looks like a mosasaur, but it’s taken on that crocodile-like form, so we’ve got an animal that was probably doing the same kind of ambush hunting.” This is particularly intriguing, as we know that there were also true crocodiles living in the same environment as P. inexpectatus. However, according to Caldwell, the crocodiles from Iharkút were smaller than those found elsewhere in the world at the same time: it appears that P. inexpectatus was occupying the ecological niche of top predator in these ancient rivers. It even had limbs that might have allowed it to move about on land. I’m very glad we had a chance to chat the other day Tyler. And particularly pleased to learn about your blog. As a retired civil engineer with a specialization in environmental engineering I have always been interested in general science and how our world works. What I have seen in my brief visit to your blog makes me believe I will be a continuing visitor. As a practicing engineer I found I never had enough time to read the in-depth scientific journals or papers, and quite frankly the jargon often drove me off. I was happy to see that one of your objectives is to remove a lot of that jargon and make science more accessible. And I really appreciate the professionalism I see here. Thanks for doing this. Thanks Dale for your kind words! Sorry it took me so long to approve your comment; it was a busy time with the holidays. One of my new years resolutions is to post more regularly, so I hope you’ll find more stuff to your liking in the coming weeks. If there are any issues from your time as an environmental engineer that you’d like to see treated here, feel free to let me know.